Does neoadjuvant chemotherapy cancel out the negative survival impact induced by surgical complications after gastrectomy? Postoperative infectious complications (ICs) are associated with a poor prognosis following gastric cancer surgery. Neoadjuvant chemotherapy (NAC) targeting scirrhous-type or bulky nodal disease reportedly exerts a prophylactic effect on the negative impact of ICs. However, a recent study clearly showed that NAC for scirrhous-type disease had no survival benefit. We investigated this prophylactic effect and significant interactions among subgroups of histological response, macroscopic type, and bulky nodal disease. We examined 115 patients who received NAC followed by radical gastrectomy between January 2008 and December 2015. The overall survival (OS) and disease-free survival (DFS) were compared between those with and without ICs. Our cohort included 62 with type 4/giant type 3, 44 with bulky nodal disease/para-aortic nodal disease, and 25 with other diseases. A histological response was observed in 80 patients (69.5%). Thirty three (28.7%) developed ICs. There was no significant difference in the OS [hazard ratio (HR) 0.96; 95% confidence interval (CI) 0.47–1.99, p = 0.920] or DFS (HR 0.74; 95% CI 0.40–1.38, p = 0.342) by the presence of ICs. The HR was 1.00 in patients who had no response to NAC (grade 0/1a) and 0.95 in those who responded to NAC (grade 1b/2/3). No subgroups showed significant interactions for the OS. 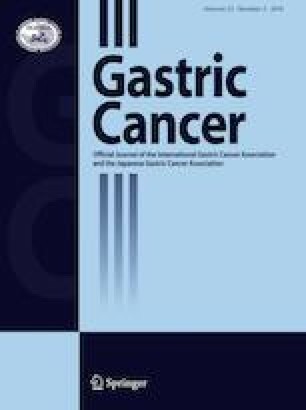 NAC may cancel out the negative impact of morbidity on the survival in advanced gastric cancer patients. The prophylactic effects by NAC do not depend on the tumor type or histological response. This study was approved by an Ethical Committee of the National Cancer Center Hospital (No: 2017-077). The authors have no conflicts of interest that are directly relevant to the content of this manuscript.